The Middle Tier: How many programmers does it take to update a Wikipedia page? 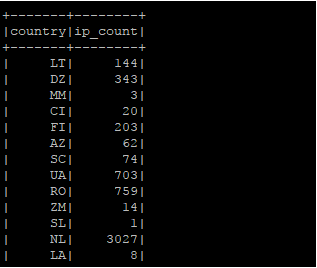 This Sunday, I found that the Wikipedia page on List of countries by IPv4 address allocation was using data from 2012. I wondered what it might take to add more up to date information on that page. During a recent course I attended, I got to know about scans.io - a fascinating project that involves periodically scanning ALL of the IPv4 address space and storing as much of publicly visible metadata about the active addresses as possible (location, ISP, open ports, services running, operating system, vulnerable services running if any). Each daily dump of the IPv4 address space is close to a terabyte. There is a lot of information to be gleaned from analysing this data - some might have very useful applications and some purely to satisfy curiousity. Also, copying the raw dataset is not the only way to analyse this - censys.io might allow querying their data directly on request. Given the volumes, this clearly falls in the realm of a Big Data problem and any querying or analytics on this is best achieved using a distributed approach - so this is a perfect problem to leverage fully cloud based resources. 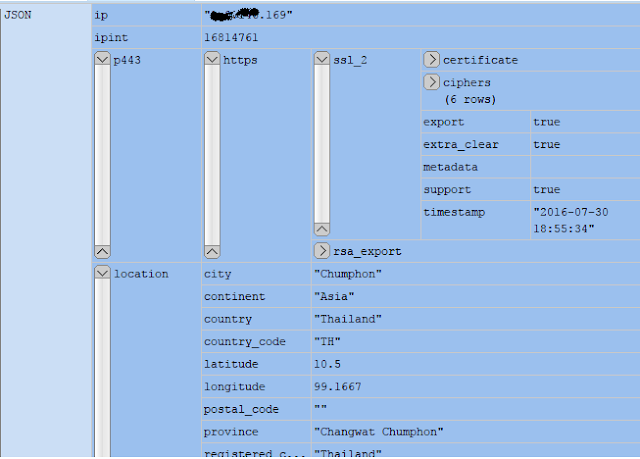 Copy the latest data set to an S3 bucket. This might sound easy but the full data is close to 1TB. Ideally I would have preferred a more distributed way of transferring this data. But for now, old fashioned wget from the censys.io and then an "aws s3 cp" to S3 storage did the job. wget of the compressed data set took around 24 hours and "aws s3 cp" of the uncompressed data took just under 48 hours (with a few hours in the middle that it took to uncompress the downloaded lz4 file). For intermediate storage, I created an instance with 2TB of storage. The cost didn't seem bad if all my data transfer completed within a day or so. For the second stage of uploading the uncompressed file to my S3 bucket, it seems an elegant and faster way might have been to use a multipart upload using a distributed approach. But looking at the upfront setup required for it, I decided against it for this particular test. AWS Setup - I already had an aws account with an SSL key-pair for the region I selected (the cheapest in terms of instance costs and also costs of S3 storage - to avoid intra region data transfer costs and possible network latency, I used the same region for both my S3 bucket and spark instances). I start an initial cluster with 3 worker nodes. One can configure a spark cluster without flintrock as well - I found a set of steps here. Flintrock made things a lot easier. Gradually increase the number of worker instances to see the data analysis speeding up as the work gets distributed evenly on the newly joined instances. After this, I could sit back and watch with satisfaction the jobs (rather individual tasks) getting evenly redistributed on the new nodes. Watch progress on the spark master console and wait for the final results to appear! I posted my initial results here - sorry to report, the counts don't quite add up. Will investigate why in due course.